NASHVILLE, Tenn. – Tusculum University’s Donovan Donaldson earned Tennessee Sports Writers Association Men’s Basketball Player of the Week accolades, averaging 25.5 points, 5.0 rebounds and 5.0 assists in two victories for the Pioneers. The Nashville, Tenn., native netted 27 points with four boards and five assists in a two-point victory over Lincoln Memorial, ending a 24-game losing streak to the Railsplitters. He connected on 10-of-20 shots overall with three 3-pointers and hit 4-for-6 at the foul line in the victory. The senior guard followed that with 24 points, six rebounds and five assists in a win against Wingate University, making 9-of-14 field goals with four 3-pointers. It marked the first season sweep for Tusculum over the Bulldogs since 2010 and helped the Pioneers claim the No. 4 seed in this week’s South Atlantic Conference Championships. Donaldson averages 15.6 points, 5.1 rebounds and 2.5 assists per game this season. NASHVILLE, Tenn. – UT Martin’s Emayne Robertson posted Tennessee Sports Writers Association Women’s Basketball Player of the Week honors, registering 26.0 points, 7.0 assists and 4.0 steals in two victories for the Skyhawks. The Memphis, Tenn., native recorded 24 points with four boards, six assists and four steals in an overtime win against Belmont, netting the game-winning points and then blocking Belmont’s final shot attempt in a 71-68 triumph. She made 9-of-18 shots with a pair of 3-pointers and played all 45 minutes for UTM. The senior guard posted 28 points with eight assists and four steals on Senior Day against Tennessee State, connecting on 8-of-14 field goals and hitting 12-for-13 at the foul line. Robertson averages 12.1 points, 3.7 rebounds, 4.8 assists and 2.8 steals per game this season. NASHVILLE, Tenn. – Middle Tennessee’s Aaron Antonini and Trevecca University’s Chase Douglas were named the Player and Pitcher of the Week, respectively, by the Tennessee Sports Writers Association for their efforts in contests from February 25-March 3. Antonini batted .500 (11-for-22) with three doubles, one home run, eight RBIs and five runs scored in five games for the Blue Raiders. The Hollywood, Fla., native posted three hits with a solo homer, an RBI double and a two-run double against Tennessee Tech. He also scored three times versus the Golden Eagles. The junior catcher netted eight hits in three games versus Memphis, including an RBI single and a run-scoring double in the 10th inning in a 2-1 win Friday against the Tigers. He collected three hits and scored twice in the second game of the series and recorded a pair of run-scoring singles in the series finale. Antonini is batting .395 with three doubles, eight RBIs and seven runs scored in 11 contests this season. Douglas tossed 9.0 innings over two outings for the Trojans, striking out 10 while allowing just seven hits and two earned runs. The Murfreesboro, Tenn., native worked 5.0 innings of relief against Ashland University, giving up one run on three hits with four strikeouts. The junior righthander picked up a win in relief versus 13th-ranked Southern Indiana, allowing one earned run on four hits in 4.0 innings. He walked three and struck out six, as the Trojans scored twice in the bottom of the ninth for the victory. Douglas improved to 2-1 with a 4.02 ERA over four appearances and 15.2 innings, giving up 12 hits with 16 strikeouts. NASHVILLE, Tenn. – Austin Peay’s Danielle Liermann and Tennessee Tech’s Alyssa Arden received Player and Pitcher of the Week accolades, respectively, from the Tennessee Sports Writers Association for their efforts in contests from February 25-March 3. Liermann batted .591 (13-for-22) with seven home runs, 14 RBIs and eight runs scored in six games for the Govs. The Simi Valley, Calif., native started the week with a 3-for-4 performance against Middle Tennessee, hitting a solo homer and a two-run shot along with an RBI single, as APSU scored six times in the seventh inning for a 10-6 victory. The senior infielder posted three hits, all two-run homers, for six RBIs in a win against Radford and was 2-for-4 with a two-run home run versus Coastal Carolina. Liermann collected two more hits with a double and a run scored against Jacksonville and ended the week with a 3-for-3 effort and another two-run homer in the second meeting with Radford. She is batting .375 with two doubles, eight home runs, 20 RBIs and 15 runs scored in 20 games for APSU. Arden tossed a pair of complete games, giving up one unearned run while striking out 14, including a no-hitter, in two outings for the Golden Eagles. The Goodlettsville, Tenn., native struck out nine and walked two in the no-hitter against Alabama A&M, though the Bulldogs plated an unearned run on a walk, an error and a sacrifice fly in the 2-1 TTU victory. The freshman righthander walked two, struck out five and allowed just four hits in a complete-game shutout versus Western Illinois. She improved to 4-2 with a 2.37 ERA in seven appearances over 41.1 innings, posting 33 strikeouts. NASHVILLE, Tenn. – University of Memphis guard Jeremiah Martin earned Tennessee Sports Writers Association Men’s Basketball Player of the Week accolades, registering 40.0 points, 5.0 rebounds, 5.0 assists and 3.5 steals in two games for the Tigers. 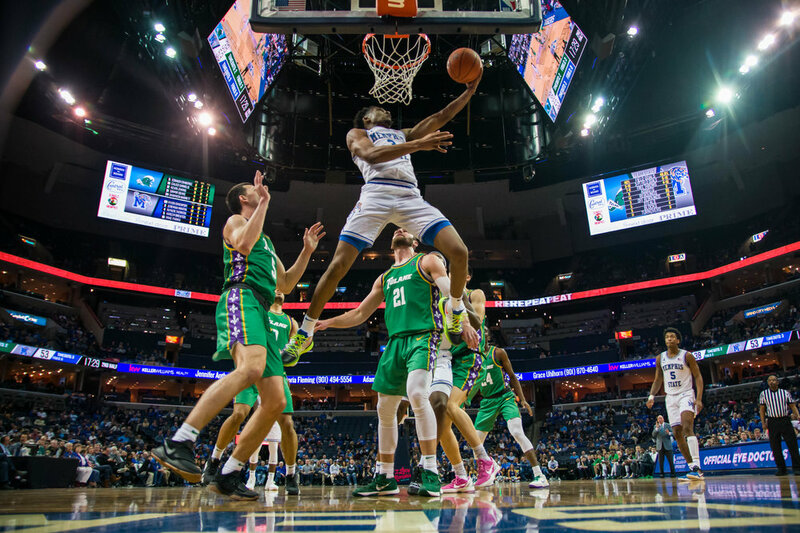 The Memphis, Tenn., native netted 43 points against Tulane, an American Athletic Conference record, hitting 15-of-24 shots overall with five 3-pointers. The senior added 8-for-11 at the foul line and recorded eight assists, seven rebounds and five steals in the victory. He followed that with 37 points at Wichita State, connecting on 9-of-19 field goals with five more 3-pointers. He also made all 14 free throws and collected three boards, two assists and two steals in the win over the Shockers. It marked his sixth and seventh 30-plus point games of the season. He has averaged 30.7 points during the month of February. NASHVILLE, Tenn. – Belmont’s Darby Maggard posted Tennessee Sports Writers Association Women’s Basketball Player of the Week honors, averaging 23.5 points and 4.5 assists in two wins for the Bruins. The Larwill, Ind., native posted 25 points with seven 3-pointers against Eastern Illinois, adding seven assists. The senior guard collected 22 points with four more triples and 9-of-14 shooting overall versus SIU-Edwardsville. Maggard eclipsed 400 career 3-pointers against Eastern Illinois, becoming just the fifth player in Division I history to reach the 400 mark. She is averaging 17.1 points and 4.3 assists per game this season for Belmont. NASHVILLE, Tenn. – Vanderbilt’s JJ Bleday and Middle Tennessee’s Peyton Wigginton were named the Player and Pitcher of the Week, respectively, by the Tennessee Sportswriters Association for their efforts in contests from February 18-24. Bleday reached base 10 times in three games for the Commodores, going 5-for-9 with five walks and a pair of RBIs. The Panama City Beach, Fla., native singled, walked and scored a run in a 5-4 win against Evansville during the midweek. The junior outfielder doubled, walked three times and scored a run in the first game of a doubleheader versus Pepperdine and posted two singles and two RBIs in the second contest against the Waves. He is batting .429 with nine RBIs and eight runs scored through eight games. Wigginton tossed a complete-game shutout in a 1-0 victory against Bradley. The Franklin, Tenn., native allowed just four hits, walked one and struck out a career-high 12 batters. The sophomore lefthander retired the first 11 batters of the game before giving up a single with two outs in the fourth and got out of trouble in the eighth after giving up a walk and a single, preserving the victory. He is 1-0 this season with a 0.68 ERA in 13.1 innings of work with 19 strikeouts and just eight hits allowed. NASHVILLE, Tenn. – King University’s Kay Brokering and Austin Peay’s Morgan Rackel received Player and Pitcher of the Week accolades, respectively, from the Tennessee Sportswriters Association for their efforts in contests from February 18-24. Brokering batted .538 (7-for-13) with four extra-base hits, six RBIs and four runs scored in four games for the Tornado. The Shelbyville, Ind., native posted two hits with a triple, two walks and two runs scored in first of two games versus Queens University and added two hits with a double and two RBIs in the second contest against the Royals. The senior was 3-for-5 with a double, home run, two runs scored and four RBIs in the second game versus Davis & Elkins. She is batting .579 with four doubles, nine RBIs and seven runs scored in six games this season. Rackel tossed 23.0 innings in a pair of games, giving up just one run with 25 strikeouts. The Calgary, Alberta, native posted a four-hit shutout (all singles) in the first of three games against McNeese State, striking out nine with three walks. No McNeese runner got past second base in the 4-0 victory. The senior outlasted the Cowboys in the final game of the series, a 2-1, 16-inning affair. Rackel struck out 16 while scattering 13 hits, throwing 217 total pitches (154 strikes). She allowed a run in the second inning and then none the rest of the way, getting the final 45 outs while giving up 10 hits in the final 14 inning, only one for extra bases. Rackel improved to 6-3 with a 2.68 ERA over nine appearances and 60.0 innings of work, allowing 59 hits with 66 strikeouts. NASHVILLE, Tenn. – Austin Peay’s Terry Taylor earned Tennessee Sports Writers Association Men’s Basketball Player of the Week accolades, netting 33.5 points and 13.0 rebounds in two games for the Governors. The Bowling Green, Ky., native started the week with 25 points and eight boards, hitting 10-of-17 field goals with a pair of 3-pointers in a two-point loss to Murray State. The sophomore then exploded for 42 points and 18 boards in a win at Morehead State, connecting on 15-of-28 shots overall with five 3-pointers. He added 7-for-9 at the foul line. The 42 points marks the most by a player in the OVC this season, besting the mark set earlier this month by Belmont’s Dylan Windler and was the first 40-point game by a Governor since Derek Wright in a triple-overtime contest against Southeast Missouri on January 29, 2008. It marked the ninth double-double of the season for Taylor, who passed the 500-point mark for the season against Morehead State, becoming only the second player in APSU history to score 500 points in each of their first two seasons, joining James “Fly” Williams. Taylor averages 20.0 points and 8.7 rebounds per game this season. NASHVILLE, Tenn. – Union University’s Morgan Martin posted Tennessee Sports Writers Association Women’s Basketball Player of the Week honors, averaging 22.7 points and 11.7 rebounds in three games for the Bulldogs. The Davenport, Iowa, native posted 28 points and 21 rebounds in a victory over Christian Brothers, hitting 10-of-12 field goals and 8-for-9 at the foul line. The graduate transfer followed that with 26 points and seven boards versus the University of Montevallo, connecting on 11-of-14 shots overall and 4-of-5 free throws. Martin concluded the week with 14 points and seven caroms against West Alabama, making 8-for-9 at the foul line. She registered five total blocks in the three victories as well, upping Union’s record this season to 25-1. She averages 17.0 points, 9.4 rebounds and 1.5 blocks per game this year. 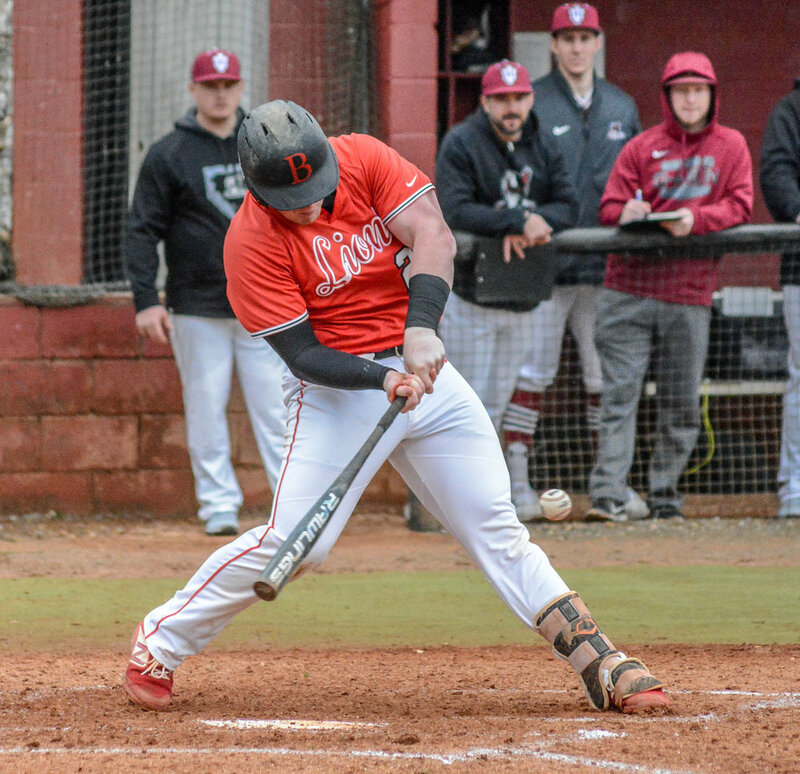 NASHVILLE, Tenn. – Bryan College’s Lake Burris and Sewanee’s Trey Holland were named the Player and Pitcher of the Week, respectively, by the Tennessee Sportswriters Association for their efforts in contests from February 11-17. Burris batted .615 (8-for-13) in four games for the Lions, posting a double, four home runs, 10 RBIs and seven runs scored. The Chatsworth, Ga., native hit a two-run homer among two hits in a 7-6 victory over Cumberland University and belted three home runs in a three-game series versus Indiana University-Southeast. The senior belted a pair of solo homers and scored three times in a 10-8 loss to IUS. He was 3-for-4 with a double, one home run and five RBIs in the series finale. For the season Burris is batting .357 with seven homers and 19 RBIs along with 12 runs scored in 12 games this season for 15th-ranked Bryan. Holland tossed seven shutout innings against MacMurray College, allowing two hits and one walk while striking out a career-high 11 batters. The lefthander retired the last 14 batters of the game, six via the strikeout, after working in-and-out of trouble in the first two-plus innings thanks to a walk, an error, two balks and a passed ball. The Durham, N.C., native has now tossed 12 shutout frames in two starts this year with 17 strikeouts and has not allowed an earned run in his last 23 innings dating to last season. Holland is 2-0 with one complete game and just three hits allowed in the two outings. 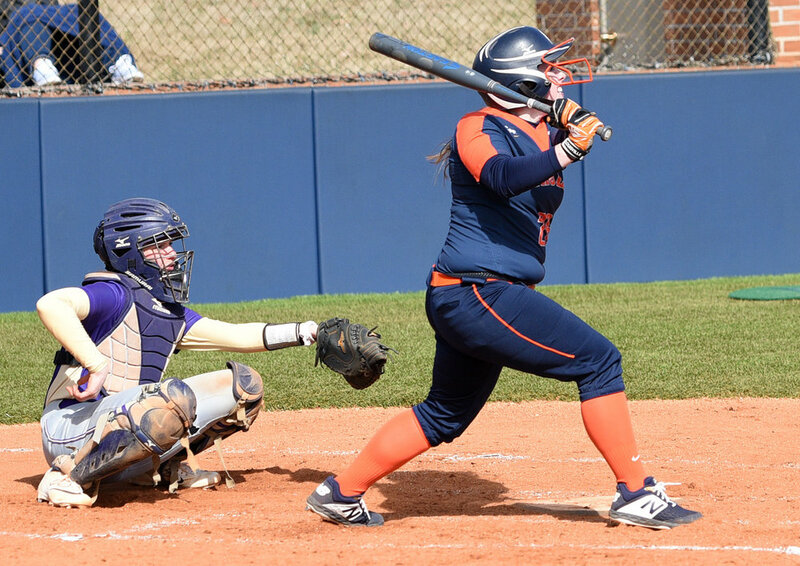 NASHVILLE, Tenn. – Carson-Newman’s Abby Fiessinger and Belmont’s Brooklin Lee received Player and Pitcher of the Week accolades, respectively, from the Tennessee Sportswriters Association for their efforts in contests from February 11-17. Fiessinger popped up to shortstop in her first at-bat and then posted eight straight hits over three games for the Eagles, collecting two home runs, five RBIs and five runs scored. The Benton, Ky., native homered among three hits and scored twice against Lander University and was 2-for-2 with a double, two RBIs and a run scored in the first of two contests versus Claflin University. She followed that with a 3-for-3 performance with another home run, two RBIs and two runs scored against Claflin. Fiessinger is batting .615 (16-for-26) with two doubles, three homers, eight RBIs and nine runs scored in nine games this season. Lee posted two victories and one save in three appearances for the Bruins, opening the season with a complete-game no-hitter against Ball State. The junior righthander walked four, hit a batter and struck out nine in the 5-0 win against the Cardinals. The Burns, Tenn., native tossed six innings in a victory against Drexel, giving up one run on four hits with three walks and four strikeouts. In the final game of the tournament in Madeira Beach, Fla., she posted a save thanks to six strikeouts over three innings. NASHVILLE, Tenn. – Belmont University’s Dylan Windler earned Tennessee Sports Writers Association Men’s Basketball Player of the Week accolades, posting 30.5 points and 13.0 rebounds in a pair of victories for the Bruins. The Indianapolis, Ind., native registered 20 points and 14 rebounds along with five assists, hitting 9-of-18 shots with a pair of 3-pointers at Eastern Kentucky. The senior followed that with a career-high 41 points on 12-of-20 shooting, including eight 3-pointers, at Morehead State, recording 12 rebounds and three steals. He scored 16 points in the final 4:56 of the first half and 11 in the final 3:31 of regulation in the 96-86 win. His 41 points represented the most points scored by any player in the OVC this season and was one shy of the Belmont NCAA Division I era single-game scoring record. 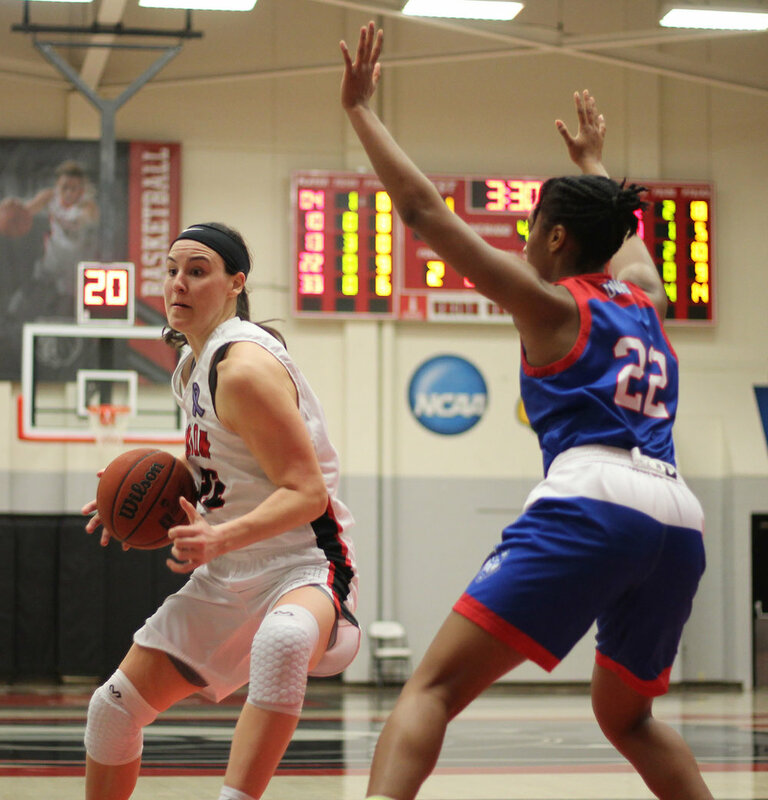 Windler ranks among OVC leaders in 10 statistical categories, including third in scoring and first in rebounding. He entered February as one of only five players nationally averaging at least 19.0 points and 10.0 rebounds per game. NASHVILLE, Tenn. – Carson-Newman’s Haris Price posted Tennessee Sports Writers Association Women’s Basketball Player of the Week honors, averaging 25.5 points, 6.5 rebounds, 4.5 assists and 3.5 steals in two Eagles victories. The Gatlinburg, Tenn., native scored 28 points on 10-of-15 shooting, including 6-for-8 from 3-point range, in a win against Mars Hill University, adding six assists, five rebounds and two steals. The senior guard then netted a game-high 23 points, connecting on 8-of-13 field goals against Coker, recording eight rebounds, five steals and three assists in 23 minutes. Price moved into ninth place on the all-time scoring list at Carson-Newman with 1,263 points. She is averaging 25 points on 60 percent shooting overall and 49 percent (29-for-49) from 3-point range since the calendar turned to 2019. One man spent his entire career at The Jackson Sun while another spent more than 40 years running the sports department at The Greeneville Sun. And the third member of the 2019 Hall of Fame Class for the Tennessee Sports Writers Association started working at The Tennessean as a teenager and has never left. Dan Morris, the late Tiny Day and Mike Organ are the newest members of the TSWA Hall of Fame, president Tom Kreager announced Tuesday. The trio will be inducted July 11 in a ceremony at Cumberland University in Lebanon. Morris is a native of Ashland City and started as a sports writer at The Jackson Sun in July 1974 at the age of 21. But Morris already had started working at the Sun while at Tennessee Martin. He married in June 1982 and never left Jackson. Morris was sports writer and sports editor covering youth, high school and college sports. He also covered Al Geiberger shooting a PGA-record 59 in Memphis in 1977 and the 1979 Super Bowl in Miami when Jackson’s Ed “Too Tall” Jones played for Dallas. He covered amateur boxing along with two World Series involving the St. Louis Cardinals, 19 college football bowl games, 21 national tournaments, Memphis basketball and University of Tennessee football games. He also covered Bear Bryant’s final game as Alabama’s football coach in 1982, a 21-15 win over Illinois in the Memphis Liberty Bowl. Morris retired in 2012, sat out a year and then returned to the Sun in 2013 writing columns and features before finally leaving the paper for good in 2016. Organ started at The Tennessean in 1975 as a teenager answering phones and running copy on weekends in the sports department and keeping stats at high school football games. He became an intern in his final semester at Middle Tennessee State in 1985, joining the sports department full-time two days after graduating and has spent 33 years with the newspaper. He has been the beat writer for high school sports (1986-88), the Ohio Valley Conference/Middle Tennessee State (1989-90), high school sports editor (1991-92), Vanderbilt beat writer (1993-2002), the Southeastern Conference (2003-04), area colleges (2009-present), sports media critic (2003-06) and Nashville Sounds (2005-2009) along with covering golf, tennis, auto racing, outdoors (2000-present) and the Nashville Predators (2009-10, 12-14). He added a weekly column in 2013 and also is director of The Tennessean/Metro Parks Schooldays Golf Tournament, the longest running golf tournament in the state. He won Best of Gannett awards for "Beat Coverage" and "Breaking News" during his time covering Vanderbilt. He also was the TSWA’s Outdoors Writer of the Year in 2017. Organ currently serves on the leadership board for the Greater Nashville Fellowship of Christian Athletes and is also on the National Football Foundation Middle Tennessee Chapter and College Football Hall of Fame executive board, the board of directors for the Nashville Old Timers Baseball Association and is co-founder and chairman of the DuPont High School Sports Hall of Fame. He was inducted into the Metro Football Coaches Hall of Fame in 2014 and also served on the Nashville Sports Council’s selection committee. Day started overseeing the Sun’s sports section in the late 1940s, and he was in charge until August 1990 when he died of a heart attack in the press box at Greeneville High School while covering a high school football jamboree. He already is in the Northeast Tennessee Sports Hall of Fame and Greeneville Recreation Hall of Fame.